The project consists of a new campus for the Central Saint Martins college of art and design, along with retail areas, leisure facilities, offices and public spaces. Main access for the services is provided by a new road bridge across Regent’s Canal. The canal is governed by British Waterways, who issue very stringent guidelines concerning construction on or around a controlled stretch of water. 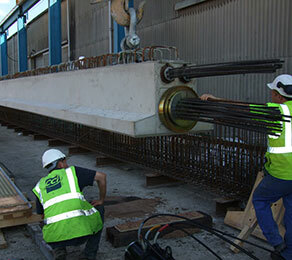 CCL was presented with several problems at an early stage of the project, concerning the design and geometry of the post-tensioning within the post-tensioned precast bridge beams. CCL’s advice to the consultant on the use of its ETAG-approved XM range system enabled them to overcome these issues and progress design. BAM Nuttall enlisted the services of ABM Precast Solutions Ltd to produce the post-tensioned precast beams. CCL was then commissioned by ABM to supply post-tensioning materials and plant, and to stress and grout 13 precast post-tensioned beams, each circa 26m long. This was done using the CCL XM30 and XM80 multi-strand bonded systems.